What strange objects these are: heavy boxes of acid and lead we motor-vehicle users haul about for hours and miles each day so they’ll supply the energy for a few seconds of work. And how strange I seem to myself for keeping this one for so many years. 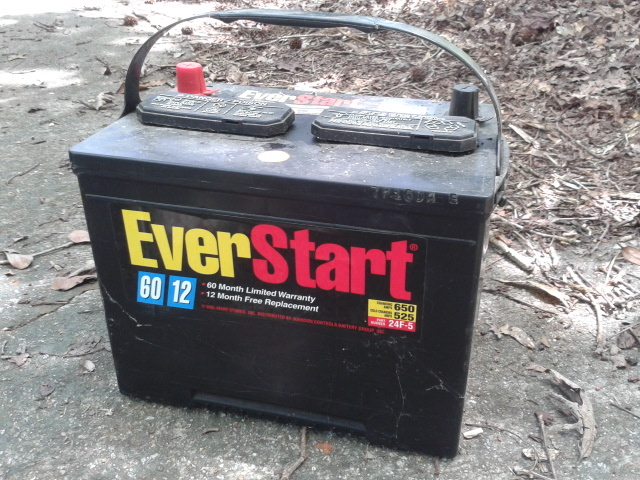 I bought it for a project car I never got running … the battery survived the shedding of the hulk. Its cells discharged, of course. Worse, the plates sulfated. But I thought that I might succeed in re-charging it, and beyond that find a use for it. I wasn’t sure what use, but sometimes I cling to hope with a throttle-hold. Today I left it at an auto supply store (most of them accept batteries for recycling). As practiced as I’ve become at letting useless stuff go, it’s energizing to notice how much lighter I feel. These books weren’t mine, in neither sense of “ownership” … I didn’t buy or receive them, and they had no claim on me, to urge me to read them. (Mostly they were an incomplete set of a religious denomination’s periodical from 50 years ago.) But they were filling a bottom file drawer in an office I’m responsible for. To the book recycler they go. I imagine they’ll get ground up into post-consumer pulp. But better that than remaining ballast. I bought this little red bowl for a quarter at a yard sale in Chicago during my first year in grad school there. 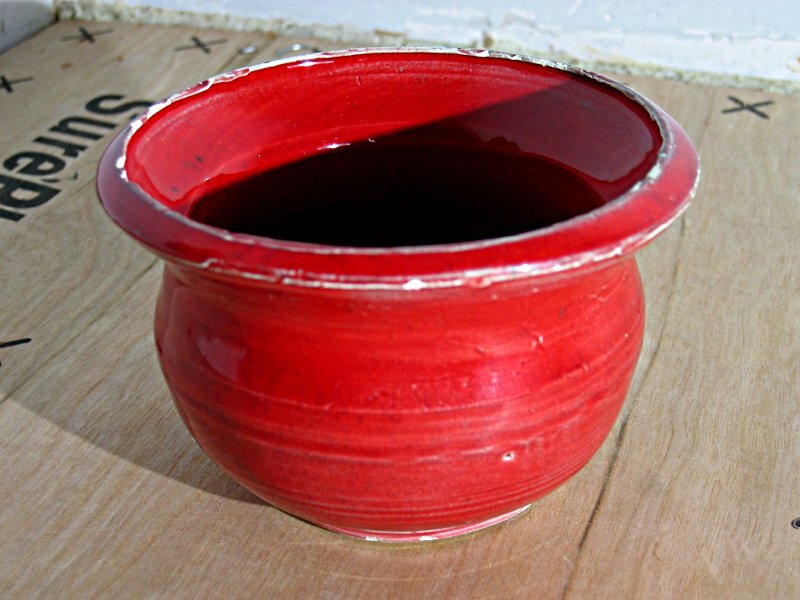 It appears to have been hand-thrown and somewhat crudely finished. A name is scratched in stilted letters on the bottom, but I can’t make it out. I guessed then, and now, that it was someone’s school art project. It’s no bigger than a small grapefruit. I recall I hoped to use it as a planter in my windowsill … I longed for something green to cheer my dorm room. But that wasn’t practical, since the bowl had no drain holes. It found another purpose, though. I’d been emptying my pockets into the top drawer of my dresser, and coins slid around and got lost under my neckties. The bowl received and held them handily. I’m not sure when I stopped using it for that … after one or another change of address, I guess. For the last few years it’s been in our home office. When we’ve found ourselves holding an odd bit that we wanted to put down, often we’ve dropped it into the bowl. So it’s collected rubber bands, binder and paper clips, pennies, small parts that fall off of things, and astounding amounts of cat hair and dust. But none of that really belongs there. Office supplies are supposed to be in the office supply box. Pennies, in the coin collector. Parts, back on what they fell off of. And so on. Comments welcome … do you have containers that collect chaos? We’re back! And today’s shed is a rather big one. I can’t remember how long ago I met the tandemobile—perhaps 15 years past. 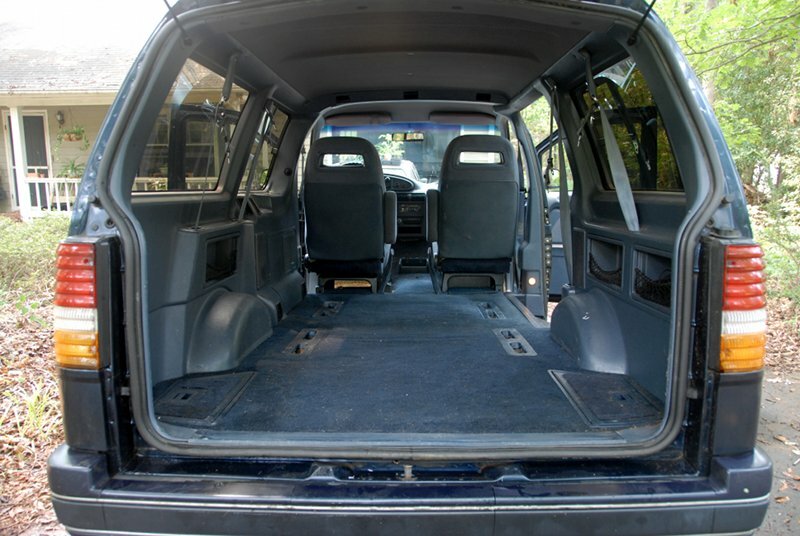 It’s a 1992 Ford Aerostar mini-van, a really rather useful melding of a passenger car chassis with a light-duty truck frame. My father acquired it as grandchildren began to multiply, so he and Mom could take them all into town to eat out. After complications due to glaucoma took his eyesight, my brothers and I were designated its drivers on those family outings. 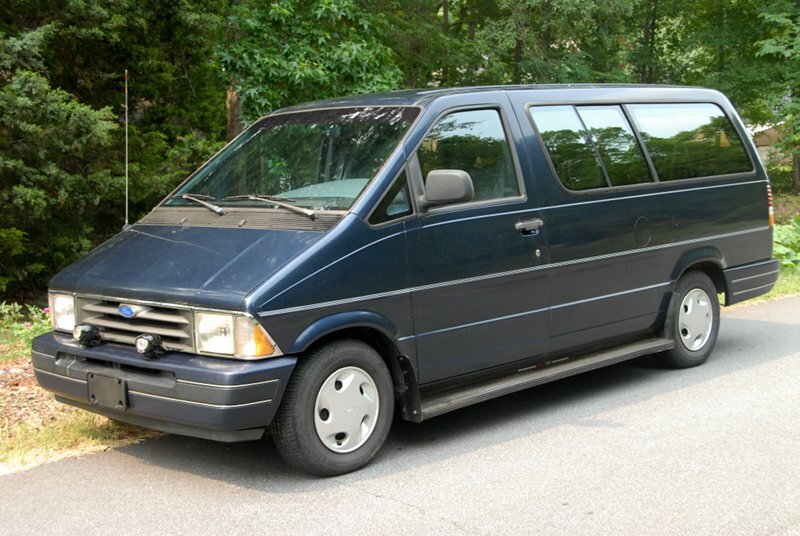 And when Dad finally decided to sell the Aerostar, Nimue and I bought it, because we’d just planned a big family gathering and we wanted to haul the g-kids to the mountain vistas their fathers and I so enjoyed when we were their age. We intended to sell it immediately afterward. But one of us wondered: if we took the seats out, would the tandem bicycle fit in the back? By about half an inch, it did. So the Aerostar became the tandemobile. For the last few years, it’s hauled the bike to dozens of rallies and remote ride starts. We’ve even slept in it a couple times when we didn’t want to bother with pitching a tent. 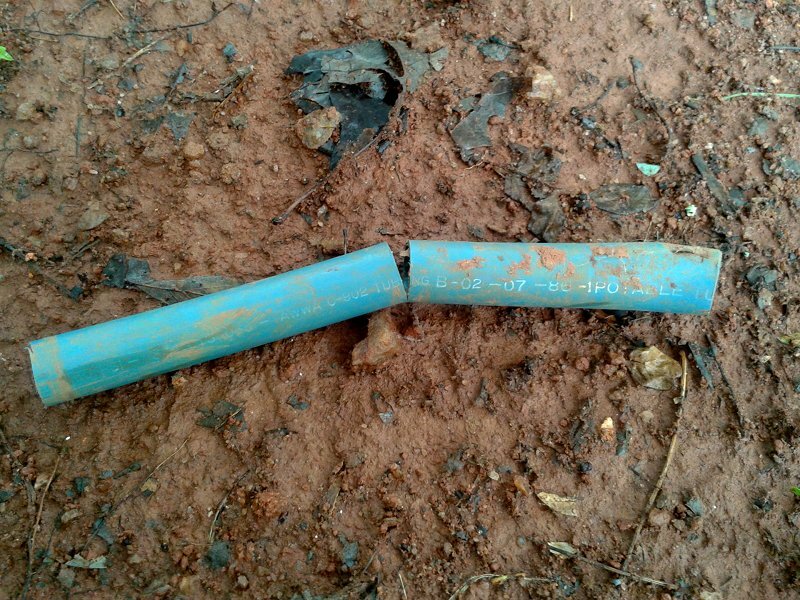 But “entropy happens.” We dealt with it as it arose. I deliberated and decided to spend a day or two crouching on concrete and straining to remove and replace most of the brake system. I signed the credit-card authorization (gulp!) to have the air conditioning system converted to R134a. But replace the whole front-end (that is, pretty much all the steering and suspension parts)? It’s a job—if you don’t have a lift and a shop, or on the other hand a $um more than the vehicle is worth—that requires banging away with chisels and hammers for hours whilst twisted into a pretzel underneath the beast. Not for me, not after some wisdom’s finally begun, however painfully, to accrue in my body and brain. We spent today giving the tandemobile a bath and manicure before advertising it for sale on craigslist. I told the truth about what it needs. (How could I not?) There are guys and gals younger than me out there, with bodies less worn and spirits hungrier, who’ll be willing to tackle it. But at this point in the adventure of my life, I think I’ll save my hunger for riding and the road.